You have to give it to Rickie Fowler, he’s got some serious class to rebound from where he was in the middle of his final round to regroup and claim the US$7.1 million Phoenix Open in style. After a pair of 64s and a third round 65, Fowler shot 3-over 74 in the final round in wet conditions on Sunday at TPC Scottsdale, to record his 5th PGA Tour title in 220 starts on tour. It was the highest final round total by a winner in tournament history and Fowler finished at 17-under to defeat Branden Grace by two shots. 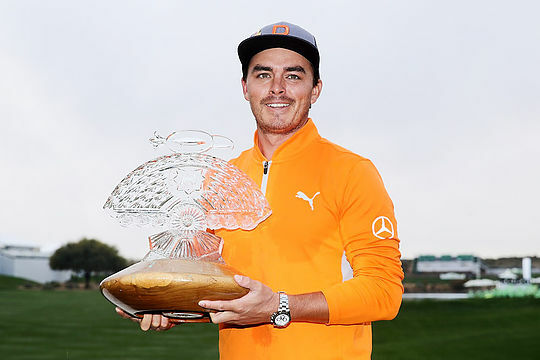 Earlier, Fowler shook off a bizarre triple-bogey on the 11th and closed with clutch shots down the stretch, finally winning the tournament that had twice eluded him following previous mis-steps at the same course. Fowler also had a double-bogey on the par-4 fifth hole, becoming the first PGA Tour player to win with a double-bogey and triple-bogey or worse since 1983 – a dubious honour he would no doubt wish he hadn’t earned. Leading by four to start the day, it looked as if Fowler would blow his lead after his scores on the 5th and 11th holes. But Fowler stepped up with two fantastic shots down the stretch. At the 15th, he found the green of the par 5 in two from 225 metres, and he reached the green on the par-4 17th with a gutsy drive from 300 metres. Both shots set up two-putt birdies that provided his two-stroke victory over Grace. “It wasn’t really fun there for a couple of holes,” admitted Fowler. This was Fowler’s 11th consecutive Phoenix Open, sixth top-25 and fourth top-10, eclipsing a pair of runner-up finishes in 2010 and 2016. He was the 36- and 54-hole leader last year as well, before finishing in a share of 11th position. Justin Thomas finished in outright 3rd position at 14-under, with three players – Chez Reavie, Bubba Watson and Matt Kuchar – sharing 4th position at 12-under-par. Cameron Smith was the best of the Aussies finishing in a tie for 15th. Smith recorded his fifth top-25 finish in his sixth start of the 2018-19 season. Aaron Baddeley missed the weekend after struggling with a second-round, 6-over 77 enroute to missing the cut for the seventh time. The 2007 champion has missed the cut in three of his last four starts in Phoenix.